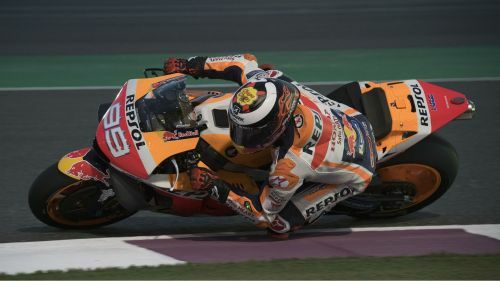 Jorge Lorenzo led calls from MotoGP's leading stars to start Sunday's race at Grand Prix of Qatar earlier, with the Repsol Honda rider considering the current schedule "quite dangerous". Lights out at Losail International Circuit moved from 21:00 local time (18:00 GMT) to 19:00 in 2018, though this year's edition is set to commence at 20:00. Worries about the conditions at that time intensified with a spate of crashes during evening test runs in pre-season, with Lorenzo one of those to fall. The three-time champion wants the plans for this weekend to be altered and intends to make his thoughts clear to race organisers on Friday. Asked about what happened during testing, Lorenzo said: "My plan was to do a half [race run] during the test, but the temperature dropped a lot and also the humidity [increased] and while going quite smoothly I crashed in turn two. "So hopefully the race will start earlier on Sunday. This is something that for sure I will try to speak about in the safety commission because at eight [o'clock] the temperature drops very dramatically and, also because of the humidity, it's quite dangerous." Reigning champion Marc Marquez backed up his new Respol Honda team-mate, stating: "Last year we raced at seven and it was a really good race. The temperature and humidity was fine, so I prefer to race at seven too. Less risky and for the show it will be better." Valentino Rossi stated a 19:00 start was "more safe" and his fellow Movistar Yamaha rider Maverick Vinales added his voice to those in support of a change. "We have to discuss it in the safety commission for sure... at seven the risk is much less and the grip on the track will be much better and we can push much more. For sure it would be a better show," said Vinales. Ducati rider Andrea Dovizisio did not share the same concerns and thinks a decision on the day of the race would be the best way forward. "The point is every day the conditions are different. Sometimes the humidity starts very early, sometimes not. Maybe it's better to take a decision early and race a bit before," said Dovizioso.